Selma Cherry, otherwise known as Dennis Mitchell, sits backstage before his performance during the 2015 Ventura County Pride's "Pride Beach" event. This event took place at Promenade Park in Ventura, Calif. on Aug. 22, 2015. Mitchell has been performing for 10 years and does occasional shows at Paddy's. "It was such an honor to perform at Pride, but when they're able to afford bigger LA acts, they won't need me anymore." Mitchell goes through his wig collection stored in his Ventura, Calif. home garage on Oct. 5, 2015. "It started off as a Halloween thing. I occasionally perform at Paddy's, but I don't like doing all of those death drops and other stuff that younger drag queens do. I mean, I'm 55 years old. I like doing simple movements." Mitchell looks at an old dress in his Ventura, Calif. home on Oct. 5, 2015. Mitchell takes off one of the dresses he wore to Pride back in August. This was photographed in his Ventura, Calif. home on Oct. 4, 2015. Mitchell takes a second to breathe while cleaning his Oxnard, Calif. childhood home on Oct. 5, 2015. His father, Anglee Mitchell, a Navy veteran who now suffers from dementia, still lives there with Dennis Mitchell's mother. "I always come on Mondays to clean the house and cook because my parents can't really see the little crumbs and dust. We also can't leave him by himself anymore so we always need someone to watch him." Mitchell's siblings and mother rotate taking care of Anglee each week. Mitchell (left) works on another one of his regular clients, Coral Norton (right). Most of Mitchell's clients are regular clients. Mitchell is constantly kept busy as a hairstylist, which is why he can only help out with father on Mondays. He has a steady base of regular clients, and in order to get an appointment with him, clients must do it months in advanced. Mitchell (left) converses with one of his regular clients, Laura Flores. (right) Mitchell has been a hairstylist for about 20 years. 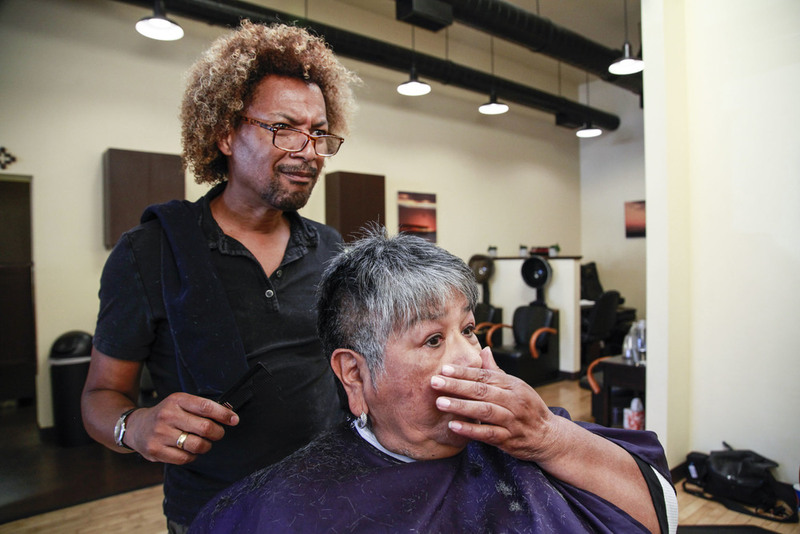 This was photographed on Sept. 29, 2015. at I Capelli salon located in Ventura, Calif.
Mitchell (left) cleans his parents room while his father, Anglee Mitchell (right) closes his eyes. "You just have to go along with what they say when it comes to dementia," Mitchell's mother, Ella Mitchell says. This was photographed in Oxnard, Calif. on Oct. 5, 2015. Mitchell plays games with his family on Oct. 18, 2015 in Oxnard, Calif. Since the majority of his family members have birthdays in October, they celebrate by having a big party for everyone. Richard Sanders (left), laughs with husband, Dennis Mitchell (right) during breakfast. "It's nice to do something on Sunday mornings. We're usually both working all the time." Sanders work full-time as a gardener and Mitchell works full-time as a hairstylist. They both met in the 80's through Richard's brother, who was also a hairstylist. Sanders was 28 at the time, and Mitchell was 20. This was photographed in their Ventura, Calif. home on Oct. 4, 2015. Sanders (left) and Mitchell (right) embrace before Mitchell leaves to takes care of his father. Selma Cherry performs during the 2015 Ventura County Pride's "Pride Beach" event, which took place at Promenade Park in Ventura, Calif. on Aug. 22, 2015. "Selma" is a day in the life portrait of Dennis Mitchell. This project was done for my former photo story class at Brooks Institute. Aside from doing the occasional drag show as "Selma Cherry", Mitchell is a talented hairstylist, loving husband of 28 years and faithful son to his ailing father.